Porsche may build the Cajun in China if sales reach a high enough volume. SHANGHAI -- Following a strong year in 2010, Porsche AG is looking to expand its dealer network into China's interior markets. The German sports car maker, which currently has 31 Porsche dealerships in mainland China, plans to open 10 dealerships a year, Porsche China CEO Helmut Broeker says. With strong sales growth in Tier 2 and 3 cities, Porsche has customers deep in China's interior, Broeker said. "Now we have dealerships in places like Taiyuan in Shaanxi province and even Erdos in Inner Mongolia," he said. In Chengdu, the capital city of China's Sichuan province, Porsche has made major inroads. "Three years ago we sold 20 cars a month in Chengdu -- now we sell 80 a month," Broeker said. Broeker hopes to exploit China's rapidly growing demand for sports cars and luxury cars. Last year, Porsche sales rose 60 percent to 13,856 units. 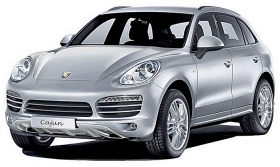 The Cayenne SUV was Porsche's most popular model in a market known for its rutted roads. Porsche sold 8,351 Cayennes in China last year, outstripping demand for the model in the United States. The Panamera four-door sedan is Porsche's second most popular model in China. To build on the Panamera's popularity, Porsche will introduce a new variant of the Panamera at the Shanghai auto show in April. Later in the year, the automaker will launch a hybrid Panamera. To exploit China's growing demand for SUVs, Porsche will introduce the Cajun, an entry-level SUV that is smaller than the Cayenne. Porsche is expected to launch production of a four-door Cajun in 2013. Porsche could build the Cajun in China in a Volkswagen factory that produces the Audi Q5, which shares components with the Cajun, the German magazine Focus recently reported. However, Broeker says that would require volume sales. "You need to have 25,000 units of a single model in one market" to justify the cost of local production, he said. Porsche also plans to make car loans available to buyers. "We are setting up a finance (plan) this year with balloon financing," says Broeker. "We aim to get a 10 to 15 percent penetration rate."